In this equation, x is the variable. It stands for some unknown number. We need to find the value of x. To solve for x, our goal is to get x on one side of the equation all by itself. To do this, we can follow the rules of math. We must keep the equation in balance. So whatever we do on one side of the equation, we must do to the other side as well. To get x by itself, we use inverse operations to undo whatever is with x. This means, we do the opposite. If something is added to x in the equation, we need to subtract it to get rid of it. If something is subtracted from x, we need to add it to get rid of it. Our answer is x = 7. When we substitute in 7 for x, the equation is true, so we know we have the right answer. 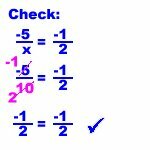 One nice thing about algebra is that you can always check and see if you got the right answer! Let's check our answer of 11. Now you try some. Solve for x for each of these. Don't forget to check your work (either on paper or mentally). 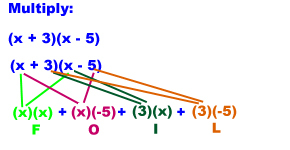 Another kind of algebra problem involves multiplication and division. Just as we learned before, we have to undo the math to get x by itself. If x is multiplied by a number, we need to divide both sides by that number to get the answer. If x is divided by a number, we need to multiply both sides by that number to get the answer. To get x by itself, we need to divide both sides by 3. Let's do a problem where x is divided by a number. Now work through some of these problems yourself. Make sure to check your work. When you have both multiplication and addition, undo the addition first. Let's check our answer of 7. OK. Let's try another problem. 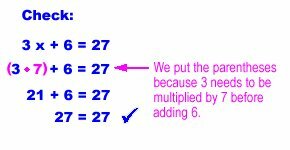 Remember that when you have both multiplication (or division) and addition (or subtraction), undo the addition (or subtraction) first. 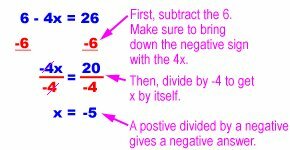 You may want to review the rules for adding, subtracting, multiplying, and dividing negative numbers in the Integers ebook. Now you try some of these. You can do your work with paper and pencil. When you are asked to simplify an expression, it means to combine any terms that can be combined. 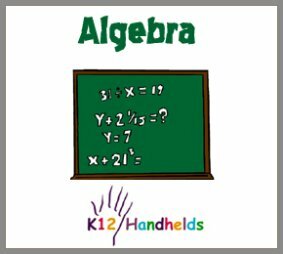 You can only combine algebra terms that have the same variable and exponent. If the variable and the exponent are the same, you can combine terms by adding the coefficients. The coefficients are the numbers before the letters. For 2x, 2 is the coefficient. For example, you can combine 2x + 3x to get 5x. However, you cannot combine the terms 3x + 4x2. Let's look at simplifying some more complicated expressions. 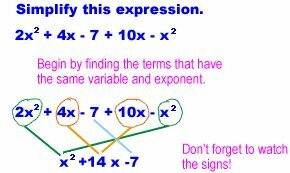 The first step is to find the terms that have the same variable and exponents. Then combine those. 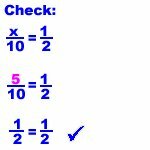 As you work on these, don't forget the order of operations. Simplify these expressions using paper and pencil and then choose the correct simplified answer. 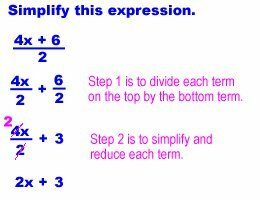 Now we're going to look at multiplying different algebraic expressions. Reviewing your PEMDAS order of operations will help with these problems. Let's do one with 3 terms. After doing each problem, make sure there is no further simplification that can be done. We can do this by seeing if there are any terms with like variables and exponents. When multiplying two sets of terms in parentheses, we use a method called FOIL. FOIL tells you what to multiply. Let's do one more FOIL problem. Now it's your turn to do some problems. Multiple each of these out on paper and then choose the correct answer to check if you are right. Now let's look at dividing. 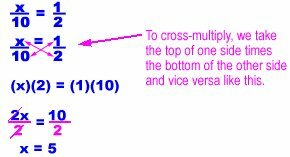 When you divide multiple terms by a single term, you must divide each of the top terms by the bottom one. You then simplify and reduce. Now, you do a few. 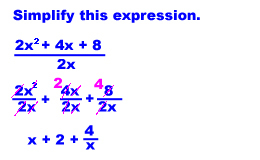 Simplify these expressions by working them out on paper and then choose the correct answer. We need to do some intelligent guessing like a detective to solve this. We can use what we know about FOIL to solve this. We know from FOIL that the first term times the first term is x2, so the first terms must be x. According to FOIL, we know that the last two numbers must multiply to equal 2. To find these terms, we can look at the factors. Don't forget negative numbers! The number 2 only has two sets factors (1 • 2 and -1 • -2). Let's try both sets to see which gives us the right middle term. This looks like the right answer! Let's check -1 and -2 just to double-check. This is not the correct answer. Our first answer (x + 2)(x + 1) is correct. Let's try one at a time and see which one works. Now it's your turn. 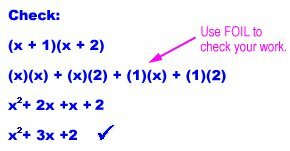 Factor these expressions using the method we just learned.